Anyone can struggle with suicide. The teenage years are especially hard and stressful. Lots of things can affect your teen’s mood and behavior. Their bodies are changing and they’re dealing with hormones. They have pressures from friends, family, and teachers. They might be dealing with negative events. Depression and thoughts of suicide are common, but can be treated. It is crucial to get help to manage depression and prevent suicide. If you think your child is depressed or at risk of suicide, talk to your doctor. You also can call the National Suicide Prevention Lifeline. This is a free counseling service that is open 24/7. It is a trusted way to get advice and support. If you are worried about another teenager, tell their parents right away. Doing this can save lives. What is teen suicide, and what causes it? Teen suicide is when a child ends his or her own life. It can be impulsive or planned. Sometimes, other people are physically hurt in the act. Not all suicide attempts lead to death. In fact, it doesn’t always mean your child wants to die. It could be their way of calling for help. Talking about death and/or suicide in a casual way. Saying they wish they hadn’t been born. Asking about death or how to commit violent acts. Talking about leaving or going away. Saying they won’t need things soon. Not wanting to be around people anymore. Seeming sad and remote, instead of happy and social. Becoming more angry or edgy. Losing interest in hobbies or events. Showing changes in normal routine, such as sleeping, eating, or grooming. These can lead to being sick or having stomach, head, or body aches. Acting out in harmful ways, such as drinking, using drugs, or hurting themselves. Depression is a main cause of suicide. It is important to remember that it is no one’s fault. It is a condition that affects your brain’s chemicals. It changes your teen’s thoughts, feelings, and choices. When you think you will never be happy again, death is not the answer. It may take time, but professional treatment will help. Many factors can cause depression. Usually it is a mix. Certain events are hard to deal with, such as death, breakups, moving, and bullying. It is natural to feel overcome or helpless. Issues like illnesses, trouble in school, and self-esteem also have an effect. Another big factor is genetics. Teens are at greater risk of depression or other mental disorders if they run in the family. Depression is a complex illness that clouds your judgment. Dealing with your own problem could make it harder to detect warning signs in your teen. Children also tend to model the behavior of adults they know. Depression can exist with other issues. Some teens turn to substance abuse to try and cure or escape their real world problems. Alcohol and most drugs are also depressants. They alter your thoughts and choices. There are other mental health conditions that can bring on suicide. Anxiety, attention-deficit/hyperactivity disorder (ADHD), and bipolar disorder are problems that also require care to prevent suicidal thoughts. Your teen could have ongoing, or chronic, depression. They also might have episodes, or a mix of both types. Some teens will try to hide depression or thoughts of suicide. They might withdraw, or act out. This can make it hard to notice warning signs. It is important to keep an open and ongoing dialogue with your teen. Ask, listen, and tell. When asked, a lot of children will open up. Talk to them to know their issues and concerns. Maybe they are scared to talk about it, or don’t have someone to listen. Tell them that you care and that there are options for help. If your teen attempts suicide, contact 911 right away. If you think your teen is high risk for suicide, contact your doctor to get help. You also should see your doctor for signs of depression in your teen. In 2016, the U.S. Preventive Services Task Force (USPSTF) changed its clinical guideline for screening teens for depression. Children between the ages of 12 and 18 should be tested. Ask the doctor to test your teen as part of their annual physical exam. This is even more important if you believe your teen is at risk of suicide. Two common tests are the Patient Health Questionnaire for Adolescents (PHQ-A) and the Beck Depression Inventory (BDI). These tests measure type, start, length, and range of symptoms. They are not meant to be the only way to diagnose. Your doctor should also consider your teen’s behavior and history. It is common for doctors to create an integrated care plan. This includes a mix of medicine, therapy, and education. Your doctor will closely manage the type, dosage, and effects for best results. Recovery time for suicide attempts and depression varies. Some forms of depression can return. Your teen might always have it and need treatment on an ongoing basis. Education is an important part of treatment. The more your teen learns, the better chance they will obey doctor’s orders. Kids don’t realize how common it is. This can comfort them knowing they aren’t to blame and can get better. It also helps reduce guilt. Include everyone in your teen’s treatment plan. Set up support plans with their teachers and coaches. Inform family members and friends’ parents on the issue as well. Your teen needs support from all areas. On top of everything, make sure your teen is okay with the treatment plan. They need to agree and feel safe in order to succeed. Routine care and tests. This includes checking for mental disorders, like depression. Let your child know they can come to you with any problem, even one that could get them in trouble. Instruct your teen on how to get help or support for problems. Include doctors, family, friends, teachers, and coaches in your teen’s well being. Surround them with positive role models. Help your teen with confidence. Teach them skills for handling conflict, violence, and peer pressure. Sadly, teen suicide can result in death. Your teen may have a friend or classmate who commits suicide. Be prepared for your teen to have emotions of anger, grief, confusion, and sadness. Talk to your teen about their feelings. If needed, provide a counselor, doctor, or friend who they can confide in. How do I know if my child is at risk of suicide? How can I look for signs of suicide, such as self-inflicted wounds? What are the differences between normal teen behavior and teen depression? 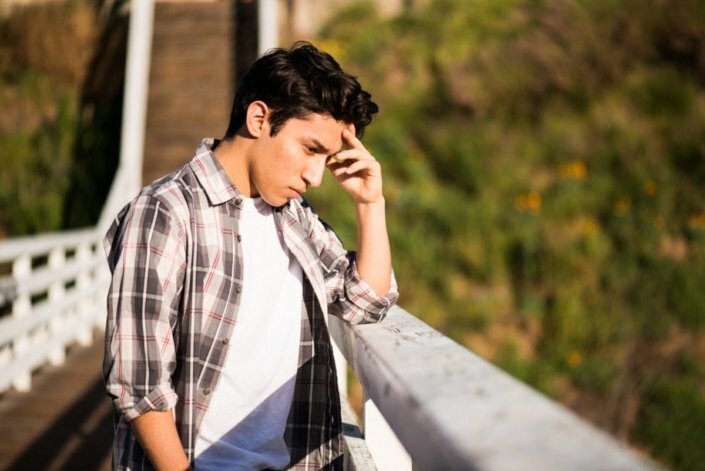 What should I do if my teen is depressed? Did I do something to cause my child’s depression? Once my teenager is treated for suicide or depression, will it come back? What should I do if my teen won’t follow treatment and gets worse?